The Flying Eagle Cent lasted only a couple of years in regular production. The coin's design element layout caused metal flow problems while striking. Several attempts were made to remedy the complication, but to no avail. 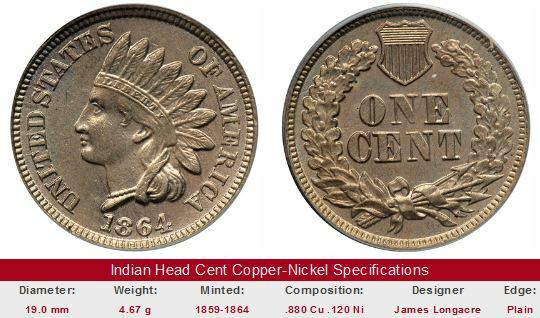 The Indian Head Cent was released in 1859, made of 88% copper and 12% nickel, just as was the Flying Eagle Cent. The metal in the cent was worth nearly the same as its face value, something the Mint thought was of critical concern. Curiously, the woman modeling the Indian wasn't a Native American at all. She was the daughter of James Longacre, the Mint Engraver who created the Indian Head Cent design. Thus, the name "Indian Head" cent is a bit of a misnomer. 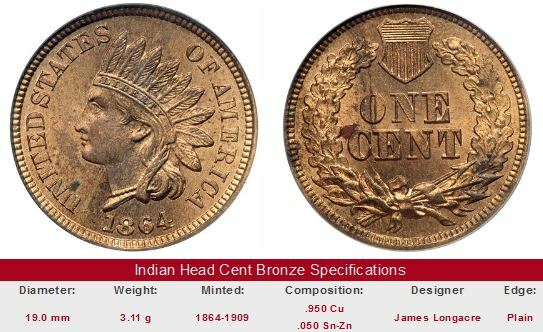 US Coin Values Advisor has completed Coin Value Tables for the Indian Head Cent, reporting price trends over a long period of time for individual dates. A copper-nickel example is shown just below. In 1862 and 1863, uncertainty over the outcome of the Civil War led to the hoarding of all coins, including the copper-nickel cent. In their place, millions of cent-sized tokens issued by private means helped the public to conduct everyday business transactions. Most of the Civil War tokens were composed of bronze (95% copper, 5% tin and zinc), and often featured patriotic or advertising themes. The tokens were quickly absorbed into the fabric of American commerce, despite the fact that the intrinsic value of the bronze metal was a far less than one cent. What's more, the metallurgic properties of bronze made it much easier to mint into coinage than the copper-nickel material. ... Whilst people expect a full value in their gold and silver coins, they merely want the inferior money for convenience in making exact payments and not at all for the value of copper, tin, or nickel which may be present... even if its intrinsic should be only one-tenth of its nominal and legal value. The world's first commercial oil well was drilled in Titusville, PA in 1859. 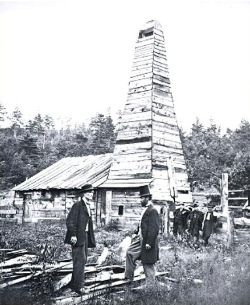 Oil operator Edwin L. Drake (in top hat) poses in front of his historic well in 1861. Drake's well was drilled to 69 feet and flowed 40 BOPD. This was actually the second derrick and engine house - the originals burned down in 1859. Drake was a former railroad conductor whose discovery gave birth to the oil industry. Legislation was introduced in Congress, and the bronze cent became a reality with the Coinage Act of April 22, 1864. The thickness of the new small cent was considerably less than its copper-nickel predecessor, while reducing the coin’s weight by about a third. The new thickness and copper color resulted in a one cent coin very similar in appearance to the penny we recognize today. An example of the bronze cent is seen at bottom. Key date Indian Head Cents are offered for sale below. The left hand side of each "Sales Box" is value trend data over a very long period of time for a coin of that date in Good-4 condition. The percent annual increase is computed for comparative purposes. The coin pictured for sale in the right hand side is not necessarily the same condition coin or same variety as that represented in the value trend analysis on left hand side. Click the "View All" link to see more selections.